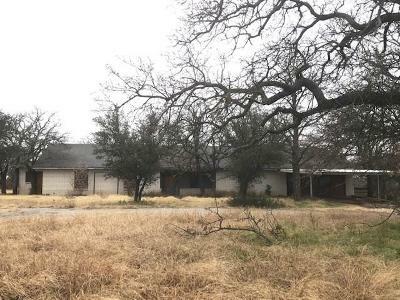 Great property on approximately 5.44 acres that sits back on property on a hill with trees around it. It has a HUGE family room with fireplace, a large kitchen with lots of counters and 5 bedrooms and 3 baths, a carport and a converted garage for a 2nd living area. It also has a large 4 stall barn with sliding doors and pens. A hold harmless agreement is in the media section and will be required to be signed by all parties PRIOR to entering into the property. Property does not have a well at this time. Buyers to verify all information. © 2019 . All rights reserved. The data relating to real estate for sale on this web site is provided from and copyrighted by the North Texas Real Estate Information Systems, Inc. NTREIS data may not be reproduced or redistributed and is only for people viewing this site. All information provided is deemed reliable but is not guaranteed and should be independently verified. The advertisements herein are merely indications to bid and are not offers to sell which may be accepted. All properties are subject to prior sale or withdrawal. Listing broker has attempted to offer accurate data, but buyers are advised to confirm all items. Information last updated on 2019-04-25.